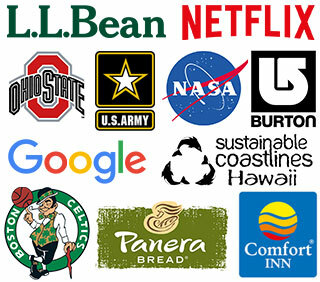 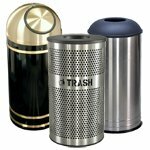 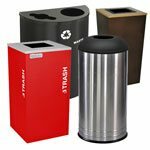 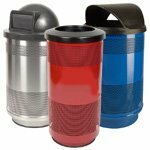 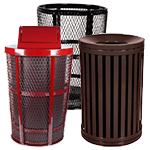 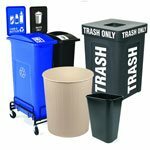 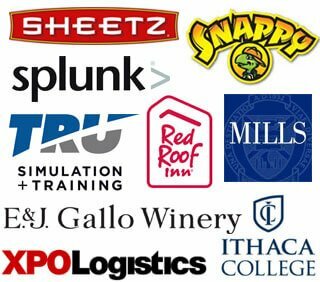 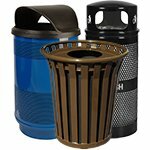 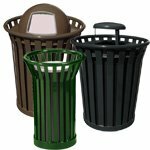 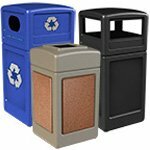 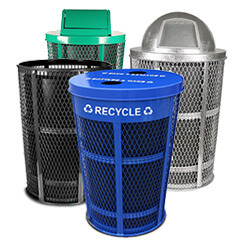 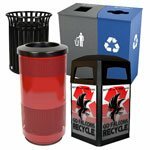 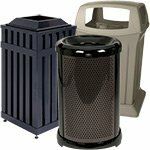 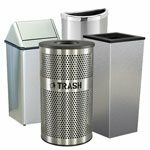 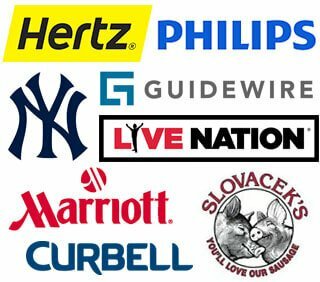 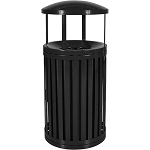 A wide variety of businesses, including themeparks, universities, boardwalks, municipal centers, farmers markets, and parks, can all benefit from the craftsmanship and durability of outdoor metal garbage bins. 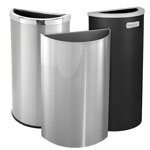 They're designed to withstand punishing weather and environments, as well as handle large amounts of trash and disposables. 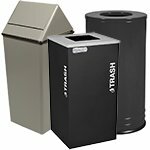 The Streetscape Metal Trash Receptacle offers a wide range of stylistic choices, as it's available in Classic, South Hampton, and East Hampton designs. 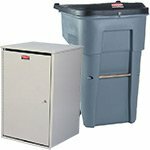 Classic-style has a 35-gallon capacity, and the South/East Hampton-styles each come with a 45-gallon liner. 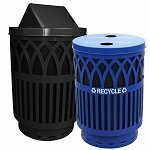 Garbage can be disposed of in the funnel-top lids. 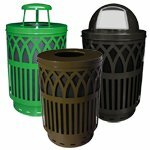 You can choose between three finishes, including Black Gloss, Coffee Gloss, and Hunter Green Gloss. 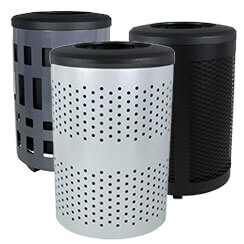 A rain bonnet can also be purchased for the funnel top lid. 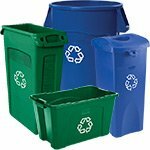 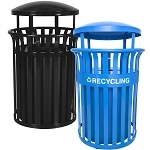 Streetscape also makes a wide range of recycle bins, including the 35.5-Gallon Park Recycling Container, available both with and without a rain hood. 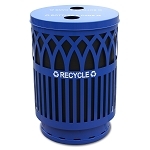 The blue-gloss finish is attractive, and makes it great for public gardens and college campuses. 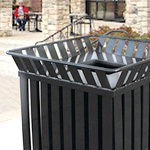 Its lid is fastened by a plastic-coated steel cable, deterring vandalism. 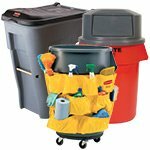 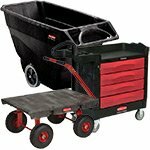 Wydman 24-Gallon Slatted Trashbin is another option that provides both decoration and functionality while handling trash at a high-capacity. 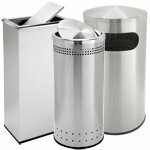 The Galvanized Steel Expanded Metal Wastecan with Dome Top is a fantastic option if maximum-durability and protection are what you need. 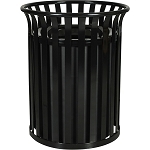 This garbagecan has been dipped in molten zinc, giving it an extra layer of sturdiness. 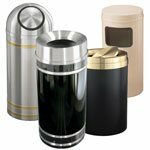 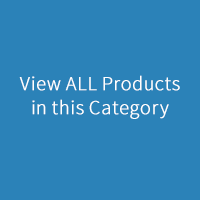 A plethora of lid-options are available, including Rain Top, Flat Top, Swing Top, and Ash Top. 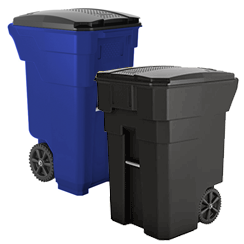 Vertical ribs have been added to the can to improve its durability even further. 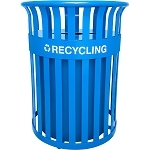 A recycleables model is also available for eco-conscious customers. 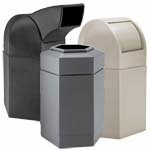 The Covington 40-Gallon Decorative Trashbin is a stylish option for those needs dependable outdoor steel-manufactured cans. 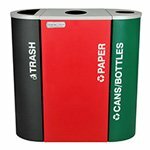 Weighing in at a whopping 80 pounds, this can is a high-performance workhorse disposal can, and can be equipped to take recyclables, bottles & cans, plastic, aluminum, newspaper, glass, and any combination of these items. 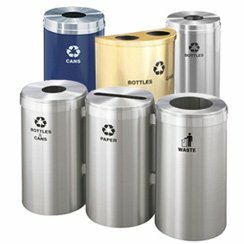 Labels can be applied to this trashcan to designate what kinds of disposables you want this can to be used for. 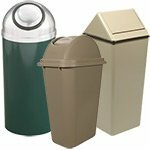 Various lids and colors are available. 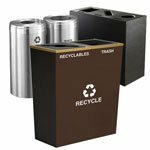 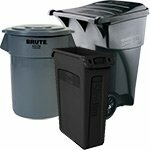 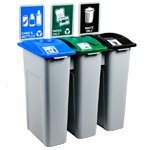 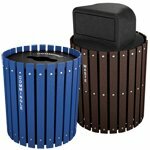 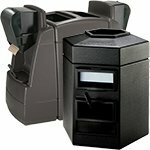 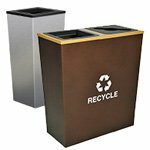 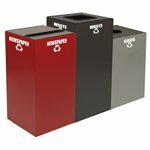 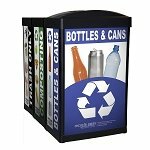 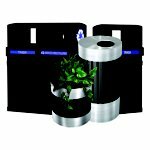 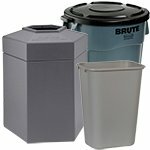 Another option comes in the Oakley 36-Gallon Slatted Waste receptacle, a robust can weighing 95 lbs. 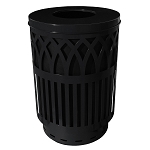 Constructed from 1/8" x 2" galvanized steel slates and coated with a TGIC Polyester Power Coat finish, this can is primed with zinc and chemically prepared before being painted, maximizing durability. 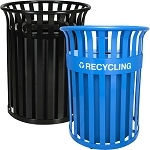 A high-density polyethylene rigid plastic liner is used inside the can to better store trash. 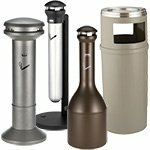 When you order the Standard Kit, you receive 3 Stainless-Steel Leveling Feet, an Anchor Kit, as well as a Lid Attachment Kit. 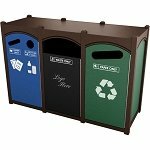 Slots and holes are available on the flat-top lids. 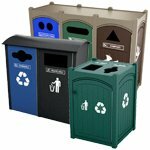 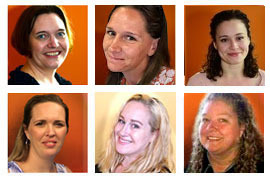 Are you looking a weather-resistant recyclingcan that can get the job done? 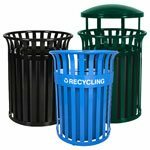 The Denver Recycling Container is what you need, made from climate-resistant steel and a good pick if you're on a budget. 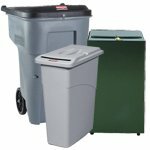 A 38-gallon capacity can, it comes with a bag retention ring, minimizing bag-movement and keeping the appearance of the can tidier. 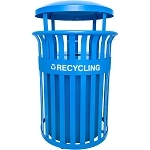 You can even secure this recycle can to the ground if needed, making for greater security. 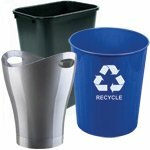 The lid has a full opening, making getting rid of recyclables a breeze. 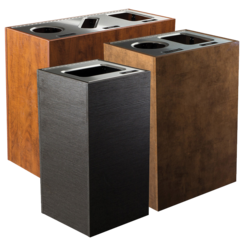 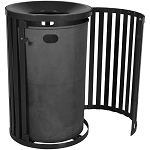 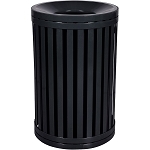 Oakley also create the 36-Gallon Steel Trash bin, a perfect fit for high foot-traffic areas. 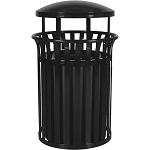 With a large steel frame chassis, this can was constructed to deter graffiti. 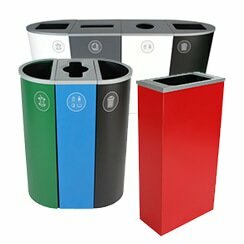 An array of powder-coated colors can be chosen for your can.